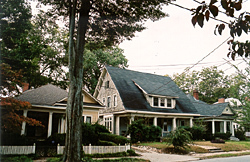 The Inman Park--Moreland Historic District is comprised primarily of residential buildings that date from the late 19th and early 20th centuries. It also includes two historic schools, two historic churches and several commercial buildings. Architectural styles within the district include Colonial Revival, Beaux Arts, American Foursquare, Bungalow/Craftsmen, and Commercial. Most buildings are one- or two-story residences, constructed of wood or masonry, with low overhanging roofs, front gables, dormer windows, and front porches. Noted Atlanta architect Willis Franklin Denny (1874-1905) designed several of the buildings including the Kriegshaber House, located at 292 Moreland Avenue, listed individually in the National Register of Historic Places. The district also stands as testimony to the incrementally developed Atlanta suburb. This type of suburban development, comprised of several related subdivisions, is characteristic of much of Atlanta's early 20th-century suburban growth. It contrasts with the contemporaneously planned suburbs like Ansley Park, Druid Hills, and the adjacent Inman Park. This district got its name from its association with Major Asbury F. Moreland, a primary property owner in the district in the late 19th century. His property, known as "Moreland Park," was subdivided in the early 1900s. In addition, the Copenhill Land Company developed a subdivision between 1895 and 1920, in the area around Copen Hill, the most elevated rise of ground in the district. The Inman Park--Moreland Historic District also includes the shopping area known as "Little Five Points," which was officially designated in the early 1920s as a commercial area by the City of Atlanta. The commercial buildings, most of which share a common party wall and have storefront windows and tile roofs, are located on Euclid and Moreland avenues at the Little Five Points intersection and on North Highland Avenue near Colquitt Avenue. As the population grew in east Atlanta in the area where the trolley lines converged, Little Five Points became one of the earliest major regional shopping centers. The southern part of the district along Moreland, Austin, Alta, and Euclid avenues is the site of the former Moreland Park, a popular resort in the 1880s and 1890s. The Inman Park--Moreland Historic District is bordered on the north and northwest around Seminole, Cleburne, and North Highway aves. The houses in the district are private residences and are not open to the public, but the commercial shops are open to the public during normal business hours. 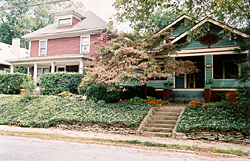 Visit the Inman Park website for further information on the neighborhood. Directly west of Albion Ave. is the Jimmy Carter Library and Museum.